I am in Cambodia with a team from Life International to assist in training church leaders about the sanctity of human life. Five years ago, Kingsland’s missions ministry worked with Life International to start a pregnancy help center in Kampala, Uganda. This center has played a key role in working with churches in Uganda to spread the message of life. Over the past five years, more than nine-hundred women who have visited the center have chosen to keep their babies. We are working with Life International once again and Steve Hyde of Asia for Jesus to start a pregnancy help center and to spread the message of life in Cambodia. Cambodia’s recent history is saturated with the blood of more than two-million of its own people who died at the hands of Pol Pot’s Khmer Rouge. The evidence of this heinous crime is still here — preserved at places like Security Office 21 and killing fields around the country. However, the evidence is also preserved in the memories of those who survived that terrible period or lost family and friends during the Pol Pot years. This morning, as I was teaching about why world-view is important, I talked about Pol Pot’s world-view. Pol Pot and the Khmer Rouge had no regard for the sanctity of human life. As a result many Cambodians suffered and died at the hands of the Khmer Rouge. By a show of hands, I learned that almost everyone in the room had been personally impacted by the nightmare that Pol Pot unleashed on Cambodia more than thirty-years ago. During a teaching break this afternoon, I took my friends Mary and Sandy to Security Office 21, located just ten-minutes from where we are teaching. I gave them a quick tour of this interrogation center where many people were sentenced to death and where many of those who were tortured died. It was a sobering experience. Because the Khmer Rouge took so many photographs of the people they tortured and killed, there is ample evidence of what can happen when those in power have no respect for the sanctity of human life. Today was my third visit to S-21 but the first time that I noticed two small paintings on display in one of the rooms. These paintings depict the fate of the babies whose mothers were tortured and killed by the Khmer Rouge. 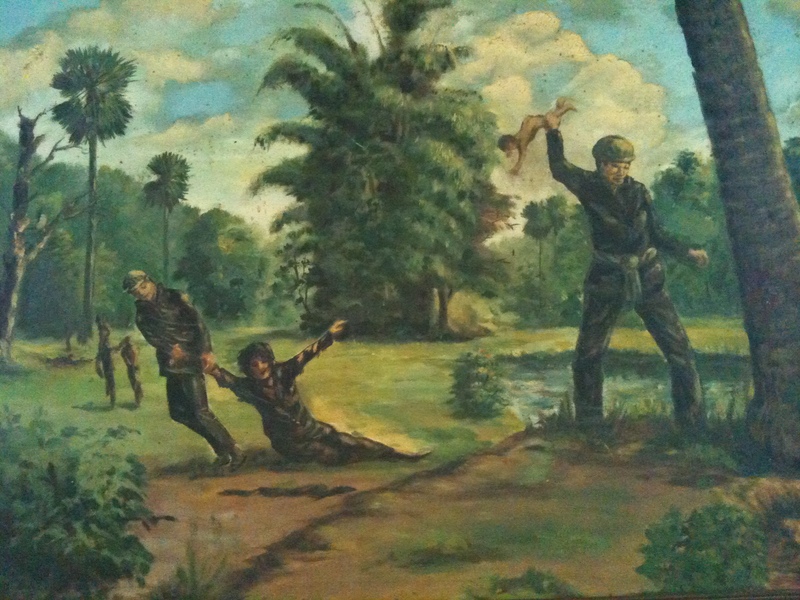 One painting depicts the infamous killing tree located at the Choeung Ek Genocidal Center, one of the many killing fields in the country. There is a sign in front of this tree with these sobering words: “Killing Tree Against Which Executioners Beat Children.” Pol Pot’s henchmen took small children from their mothers and smashed them against the killing tree. 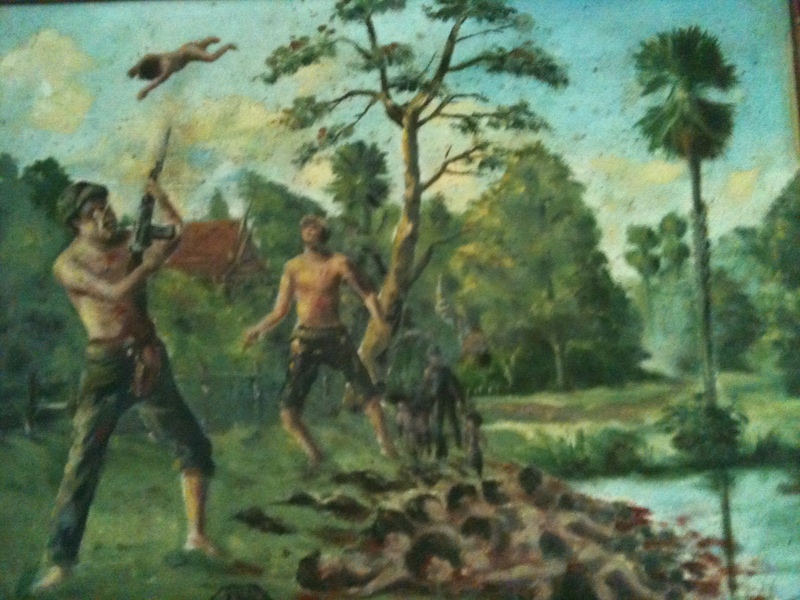 The other painting depicts the Khmer Rouge tossing babies up in the air and then shooting them. To save ammunition, they also tossed babies in the air and impaled them on the bayonets on their rifles. This is the ultimate depraved expression of where disrespect for human life can lead. These two sobering paintings offer a glimpse into what was a horrific period for Cambodians and illustrate why what we believe about the sanctity of human life matters. When it comes to the sanctity of human life, Christ-followers must side with life, stand against death, and fight for justice. It is not enough to say that we are passionate about matters of injustice and then do nothing. Passion must lead to action on behalf of the weak and oppressed. We must continue to work toward the day when the womb is no longer a killing field. Anything less is a betrayal of our Christian worldview. Powerful O. Thanks for leading us in the fight against injustices like these. Being a dad I could not imagine experiencing this kind of torture, as a man its hard to imagine this level of depravity.